With the breakout for spot price silver now complete we should expect to see the commodity continue to move higher in the next few weeks, building on the solid platform of potential support now firmly established below in the $16 to $17.50 per ounce price level. 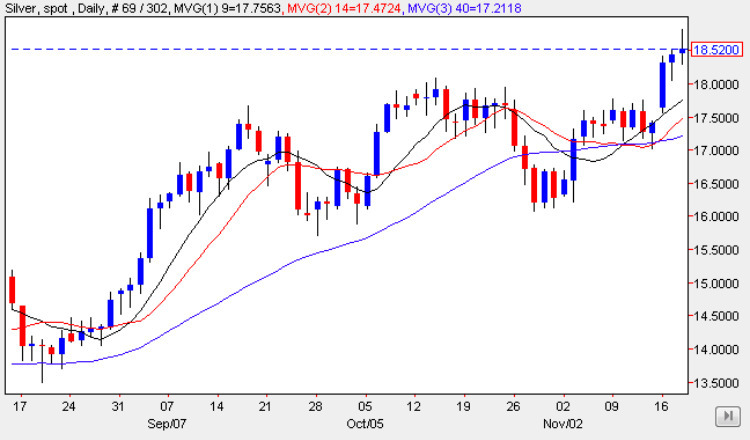 However, yesterday’s price action for silver was far from convincing, with the commodity ending the trading session with a narrow spread up candle and a deep shadow to the upper body, suggestive of a shooting star candle, and therefore somewhat bearish – not a good signal for silver bulls! Nevertheless, given the recent breakout and the potential strong support below, we can expect any pullback from this price level to be relatively minor, particularly with all three moving averages now pointing sharply higher following the recent strong move, and provided we see a clear break and hold above the $18.50 per ounce level in due course, then we can safely assume that the bullish momentum remains firmly in place and can expect to see a longer term target of $20 per ounce achieved in the medium term. However with the spot gold price also showing a degree of ‘slowdown’ and tiredness, do not be surprised to see the two commodities move lower in the next few days before recovering and pushing higher in due course.